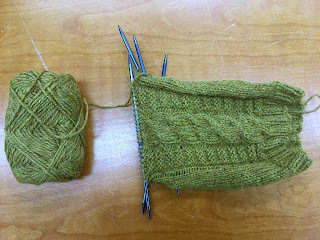 I've been ticking along at this legwarmer during my lunch breaks this week, and it's now just over halfway finished. Mirroring the cable has been a lifesaver in terms of second-thing-syndrome, which I am super prone to. This weekend I'm hoping to finish getting the pattern for the yellow hat ready for my editor and to pull together the pattern for these legwarmers. I keep taking moments to remind myself that I'm in the middle of rehearsing a play right now, and things are very busy, and kind of hectic, and it's okay if I'm not as productive as I am when all I have going on is library work and design work. Over the past year I've made tons of progress in being able to listen to myself and let myself step back and do nothing for a while when I'm feeling overwhelmed, and that's definitely a skill I want to keep working on. The legwarmers should be done by the middle of next week, at the latest, so I'll be able to start focusing more on my Easy A-long project. It's in pretty good shape - there are almost six weeks left in the KAL and I have almost half the front done, so I'm not too worried about finishing it on time.